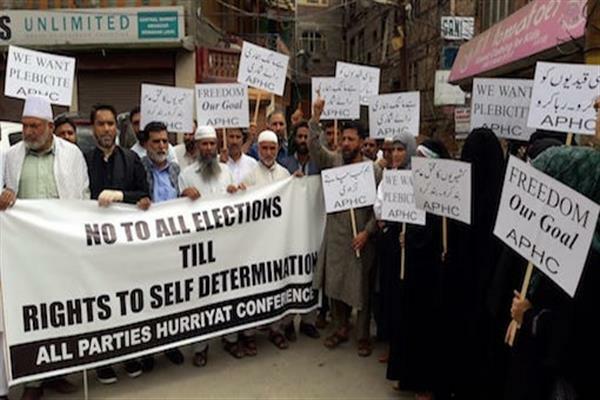 Srinagar, September 7 (KNO) : All Parties Hurriyat Conference kick started anti-election campaign by organizing a rally at Abi Guzar Srinagar, in which senior Hurriyat leaders, activists and people belonging to all walks of life participated. Under the leadership of Mohammad Yaseen Aataie, the rally marched through the Abi Guzar Street, displaying anti-election banners and placards denouncing human rights violations, civilian killings and arrest spree at the hands of occupation forces. Chanting slogans in favour of right to self-determination and probing of human rights violations, the rally was attended by senior leaders and Hurriyat activists including Bilal Sidiqui, Gh. Mohammad Nagoo, Mohammad Yousuf Naqash, Nisar Hussain rather, Molvi Bashir Irfani, Yasmeen Raja, Imtiyaz Ahmad Shah, Syed Mohammad Shafi, Khawaja Firdous, Manzoor Gazi, Gh. Qadir Kashmiri and others. The rally protested against the inhuman behavour meted out to the incarcerated leaders in Tihar jail including Shabir Ahmad Shah, Altaf Ahmad Shah, Pir Saifullah, Ayaz Akbar, Raja Mehraj-ud-din Kalwal, Shahid-ul-Islam, farooq Ahmad Dar, Nayeem Ahmad Khan, Mohammad Aslam Wani, Shahid Yousuf, Dr. Gh. Mohammad Bhat, Muzfar Ahmad Dar, Asiya Indrabi, Fahmeeda Sofi and Nahida Nasreen and condemned the prolonging of the illegal detention of Masarat Aalam Bhat, Dr. Mohammad Shafi Sharyati, Dr. Mohammad Qasim, Gh. Qadir Bhat, Nazir Ahmad Sheikh, Gh. Mohammad Khan Sopori, Mohammad Yousuf Mir, Mohammad Yousuf Falahi, Ab. Gani Bhat, Bashir Ahmad Qureshi, Umar Aadil Dar, Mushtaq-ul-Islam, Farooq Tawheedi, Asadullah Parray, Ab. Rashid Magloo, Hakeem Showkat and others. Hurriyat spokesperson condemned house arrest of Hurriyat General Secretary Gh. Nabi Sumji, early this morning, who was scheduled to lead the anti-election rally in Srinagar. The spokesperson also castigated the police authorities to arrest another senior leader of the conglomerate, Hakim Ab. Rashid, who has been shifted to central jail Srinagar without any legal justification. Condemning the arrest spree at the hands of occupation police authorities the spokesperson alleged that Kashmir has been virtually turned into a police state, where peaceful political activities have been barred by the deployment of heavy stringents of military forces.